Ocean View 3 Bedroom Condo in South Kihei ! This spacious deluxe condo apartment (1336 sq ft of luxury) is ideal for families or multiple couples wanting accommodations close to beaches, shopping, dining and all that Maui has to offer. We strive to keep our condos upscale and well equipped with all the comforts and conveniences of home. Situated overlooking the ocean, directly in front of Cove Park, the location is ideal for whale sightings, watching the surfers, enjoying those amazing Maui sunsets or watching the world go by in paradise. Just steps from Kamaole Beach,the shops and restaurants of Kihei Town Center and nearby golf then this condo is for you!!! There is a full size washer and dryer in the unit. Free high speed Wi-Fi with cable modem. We have tastefully decorated the condo with Island Style artwork and furnishing. (2014 renovation, which included all new kitchen and bathrooms) Unit is extremely clean, well maintained and equipped with a new 4 zone air conditioning system (March 2016) serving all 3 bedrooms and the living area. ALOHA!! Our check-out time is 10 am, check-in 3 PM. New 4 zone A/C system (Mar. 2016) that includes all 3 bedrooms and the living area. Each zone is individually controlled by remote control for maximum comfort. This system is very quiet. Free on-site parking for one vehicle. Spaces are not assigned. Onsite court. Tennis racquets are in the condo. VIEWS, VIEWS!! Phone, Full LARGE Kitchen and ALL appliances, Hot Tub, Pool, Gas Grills (BBQ), tennis court on site and golf courses nearby. We had a wonderful time in Maui. The location of the condo was very covenant for day trips or to just walk across the street to the park that had a small sand beach. The fact that the bedrooms and living room had seperate air conditioner units ment that all of us could be comfortable. The BBQ area, has several grills so there was little wait time. The people at the condo where friendly, and the condo was stocked with some basic things, which met we didn't have to purchase quantities of things we wouldn't use, like salt, sugar, coffee, etc. Clean, roomy, and great location!!! 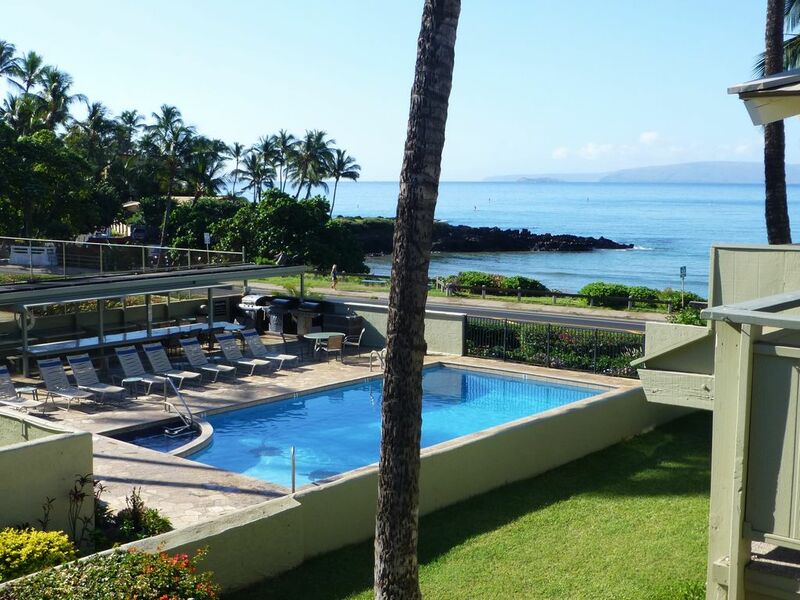 The Shores of Maui is located in Kihei and is an amazing place to stay. Incredible ocean views, great pool and spa. Friendly neighbours. Our Unit owned by Larry Piech was wonderful. Very clean, spacious condo with everything we needed down to a bucket and spade for the beach for our 7 year old grandchild. Stunning art on the walls and comfortable beds. There were 5 adults and 1 child and plenty of room for us all. We met family from Vancouver there and we are from New Zealand. Kihei is central to so many places on Maui and this place more than exceeded our expectations. The condo is air conditioned and we appreciated this very much. Lovely bed and bathroom linen provided, complete with all amenities. Would thoroughly recommend Shores of Maui and Larry's condo to all discerning travellers heading to Maui. This unit is spacious, quiet and tastefully decorated in classy island colors! The complex is located near beaches in either direction that are family friendly. Plenty of eating choices... eat in, bbq at the pool or go out! We traveled with our four teenage kids... it was perfectly set up for us ... they could sleep late... walk to rent bikes, taste the local Poki or shaved ice and never venture more than a few blocks! The kitchen was fully equipped, plenty of towels, comfortable furniture and full size laundry machines. The lanai has a table and chairs to enjoy and has many beach/pool/snorkeling equipment to barrow! Both showers have great water pressure and the beds were comfy! Ceiling fans and air conditioners made any weather enjoyable! We would stay here again! The property was great and met all our needs. This property was beautiful condo that met all our needs. We had 4 adults and 2 teenagers in our party and we all fit fine. The main living space was quite spacious. As with the other reviews, the lanai was very small but it really didn't bother us at all. We spent most of our days out doing activities in Maui and enjoying Hawaii. The property is very close to many shopping and eating places. The beach is right across the street. We had a few issues with the wifi but Larry was very responsive to my emails and Allen who lives on the island came over and took care of the issue promptly and was so nice and helpful. We had a great time. If ever in Maui again, we would use this property in a heartbeat. Mahalo!! Check-in time is 3 PM and check-out time is 10 AM. Last Minute discounts! Reservations made less than 45 days from arrival date receive a 15% discount. This discount applies to Low Season only.